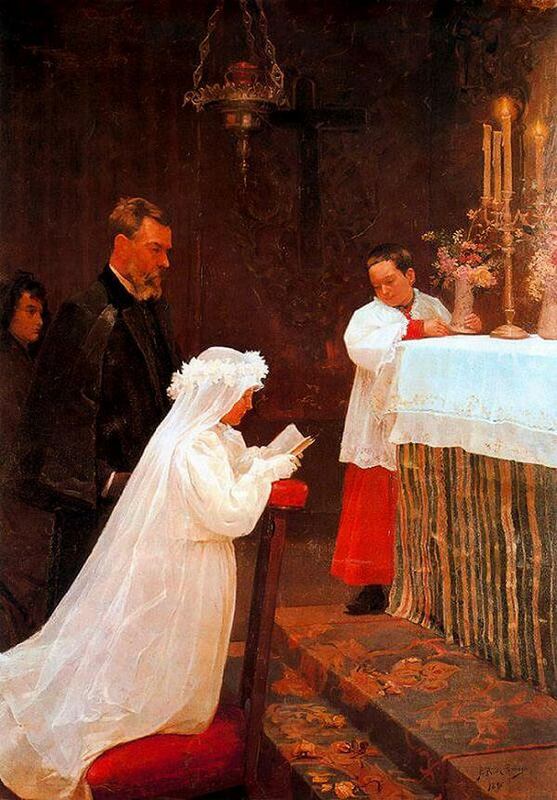 While attending La Lonja School of Art Picasso produced his first large-scale oil painting, entitled First Communion. The work was exhibited at a major exhibition in Barcelona and attracted the attention of the local press. It conforms to many of the expectations of academic painting at the end of the nineteenth century, emphasizing a dramatic moment in the youth of a Catholic girl as she kneels before the altar, about to take her first communion and thus make the symbolic transition from childhood to adulthood, Picasso has highlighted this sense of passage by linking the bright white of the young girl's communion dress to the white of the altar cloth and the candlelight that illuminates the whole scene. It is perhaps no coincidence here that Picasso focused upon a moment of transition. The fact that Picosso's own father modelled for the male figure in this work odds another important dimension to the work, which equally marks Picasso's own symbolic transition from artistic childhood to adulthood, as his work entered the public domain for the first time.